The Gauge Restraint Reader is a precision measuring instrument that needs to be protected in transit from storage location to the track. Set of two carrying cases for Gauge Restraint Reader. 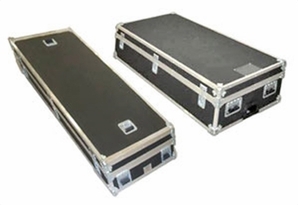 Durable suitcase-style, ABS plastic molded over plywood, with steel reinforced corners and edges. Rain and dust-proof. Foam lined. • Case A: for hydraulic ram push bar, 60" x 16" x 7"
• Case B: for yellow 2 pc. chassis, 48" x 24" x 14"